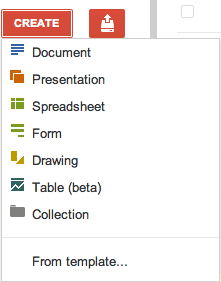 Aaron, a reader of this blog, spotted a new option in Google Docs: creating tables. It seems that Google Docs started to integrate with Fusion Tables, a little-known Google service that lets you manage large data sets. 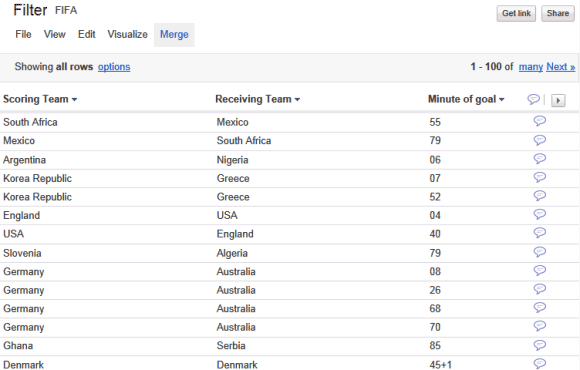 "Google Fusion Tables is a modern data management and publishing web application that makes it easy to host, manage, collaborate on, visualize, and publish data tables online." You can find some examples in the gallery. There are also many tutorials that help you create tables and turn them into maps. I think you need to email gostips@gmail.com. (that's what it says at the top of the page). What's new in Fusion Tables? Fusion Tables now appear in the Google Documents list, and are available via the Documents List API ACL and Folder feeds. The feature is not yet available to hosted domains (Google Apps for your Domain). Apparently they have to integrate into all levels of GAFYD (including the free/personal) level before it gets released to us! I tried fusion tables when it first came out, trying to upload voter data from my state's board of elections (easily readable in excel, for example) and got the message "Import failed. Please try later." Well, it's much later. Same result. Is Google totally unable to tell me what went wrong or how to go about fixing the problem? The help pages apparently never heard of this error message. I'll try again in six months or so. i like the feature whereby we can turn it into maps..
Should Google convert Fusion Tables to Access like, it would be great! Great development work! Nice to have this great feature, creating tables. Off course, we will find it most useful one.